Before I get into the meat of this review, let me just say that Anthology Vols. 1 & 2 is a fantastic introduction to the wild and varied sound of Kid Creole & The Coconuts but it's also an excellent addition to any fan's collection as well. The sell sheet for this two CD anthology didn't hide the fact that this was a collection of re-recorded versions of past glories (and new tracks) and I was good with that. I've been a Kid Creole fan for 20+ years and while I wasn't too thrilled with the idea of re-recorded tracks, I'd certainly give it a listen and I knew I'd at least enjoy it. Heck, just to get new Kid Creole songs was good enough for me! When I first threw Anthology on, I was fully prepared to quickly skim through it just to hear what August "Kid Creole" Darnell and the gang had done with all the gems from their back catalog. But then, something caught my ear... "Welcome To The Lifeboat Party, Chile" (formerly titled "The Lifeboat Party") was new and vibrant... but also sounded very much the same. Upon closer listen, I realized that the track was a re-arranged and updated version of the original recording containing honest-to-goodness elements of the original backing tracks with new instrumentation and vocals added! I know that that statement sounds like wishful thinking, but I've listened to Kid Creole constantly for years and I've heard most of these tracks a zillion times. And I'm also aware that whenever an artist re-records their hits, they always seem to change things up a bit since they've performed the songs so many times over the years. I've never heard an artist go into the studio and re-create certain vocal passages exactly as they recorded them 25 years previously. Close, sometimes, but never exact. Then I listened to even more of the disc and realized that almost every track was recreated using the ORIGINAL recordings! "I'm A Wonderful Thing, Baby", "Annie I'm Not Your Daddy", 'Stool Pigeon", etc. While it's hard to describe, what you need to know is that Anthology Vols. 1 & 2 is not a simple hits collection: it's an entertaining and exciting new way to listen to Kid Creole and The Coconuts without straying too far from home. For example, "Stool Pigeon" may sound new, but if you listen closely to the rhythm track, the guitar and the backing vocals, they will sound more than familiar to longtime fans. Darnell's lead 'rap' on that track is definitely new as well as some of the instrumentation and additional backing vocals, but the foundation of the song is taken from the original recording found on the Tropical Gangsters/Wise Guy album. They've even cleverly added a new break to the song that most likely evolved during constant live performances of the song. Same goes for practically every song from their most popular period in the late '70s and early to mid '80s. It's a clever way to reinvent the songs without totally re-recording them. As for the new tracks, they are all must-haves for any fan. "Young, Gifted, & White" adds a little Santana influence into the band's sound. "Cool, Calm & Collected" is a wonderful poppy track that wouldn't have sounded out of place on their Doppelganger album. The cover of "My Boy Lollipop" is a great mix of Rock, Pop and Latin influences. "Roman Holiday" is a radio-friendly R&B groover. Finally, "Dr. Paradise" is prime Kid Creole, mixing about five different musical genres into one four minute track! 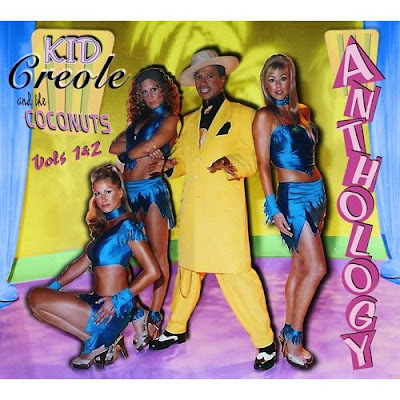 Kid Creole & The Coconuts' Anthology Vols. 1 & 2 is an excellent look back and move forward... at the same time! Don't hesitate, fans!